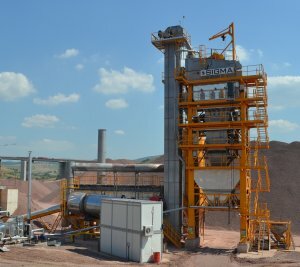 260 tons/ hour capacity SIGMA asphalt plant is in operation for one of the most prestigious projects under construction in Turkey; the First Phase of Istanbul – Izmir Motorway. The starting point of the project is at Gebze and the motorway passes Izmit Bay through a recently opened suspension bridge of about 3 km in length and the first phase will end at Bursa. The Izmit Bay Crossing Bridge will be one of the longest bridges in the world. The second phase of the new motorway to be constructed will re-start from the existing Bursa Ring Road, pass through Balıkesir, extend to the west near Turgutlu, continue in parallel to Izmir-Usak State Highway and be connected to Izmir Ring Road. Commissioned in May 2014, the asphalt plant is equipped with normal and PMB bitumen tanks of 50 tons capacity each, heated by a 1.000.000 kcal/h capacity thermal oil heater. PMB tanks are equipped with agitators for polymer modified bitumen storage. The plant is controlled by a central computer inside the control cabin in fully automatic or manual modes. The hot-mix storage silos, located under the mixer, have a capacity of 40 tons. Automatic fiber dosing system is also integrated to the plant for SMA (stone mastic asphalt) application. Until the end of August 2016, the plant produced successfully about 1.000.000 tons of hot-mix asphalt which is used at the first phase of the motorway.